Santorini Palace is the very first resort in Santorini, only a few meters away from the cliff of the Caldera and the panoramic view of the volcano. The hotel offers a combination of beautiful Cycladic architecture, open spaces, resort facilities and proximity to interesting sites. 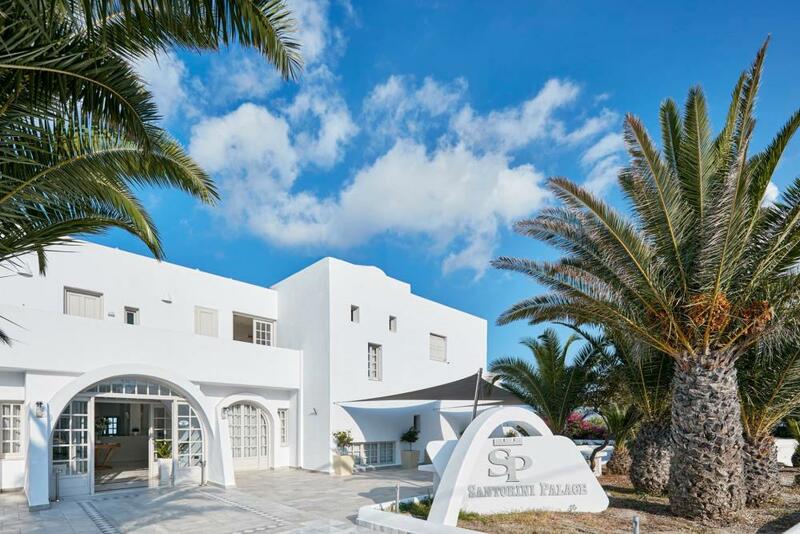 Guests may take full advantage of the resort facilities, the peaceful Hotel Spa atmosphere, keep up with their fitness in the fully equipped gym, relax by the pool, enjoy a walk on the Caldera’s promenade or even experience Fira cosmopolitan nightlife. 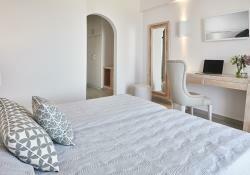 Built with respect to the traditional architecture, Santorini Palace offers 106 spacious rooms decorated with style. All air-conditioned rooms open to a balcony overlooking the well-tended garden or the Aegean Sea. Facilities include a satellite TV and minibar. Each private bathroom is fitted with a rainfall shower or a bathtub and hairdryer. 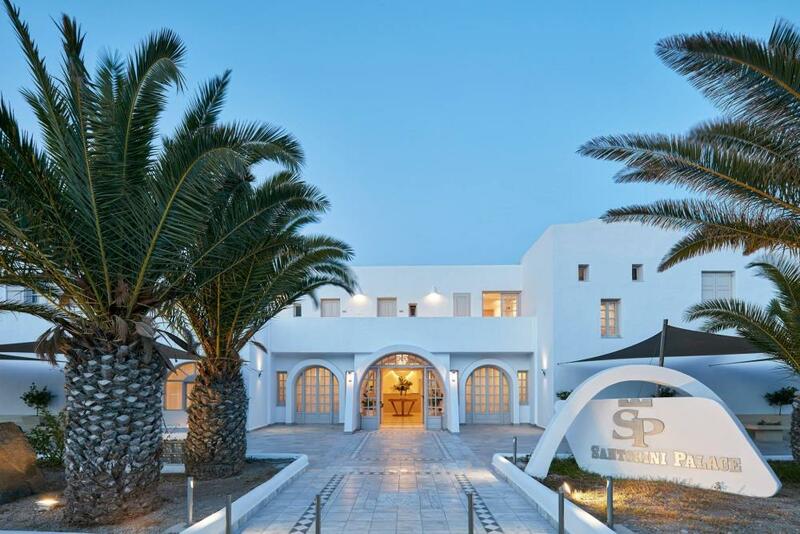 Santorini Palace hotel is ideal for combining leisure and business, couples or family vacation, due to the mixture of its facilities. Along with a restaurant, this hotel has an outdoor pool, a fitness centre as well as a bar lounge, a poolside bar and a sauna. All 106 rooms provide complimentary wireless Internet access, minibars and flat-screen TVs. Guests will also find room service (during limited hours), in-room massages and hairdryers. Start your day with a rich American buffet breakfast, filled with aromas and homemade tastes from the Cyclades. 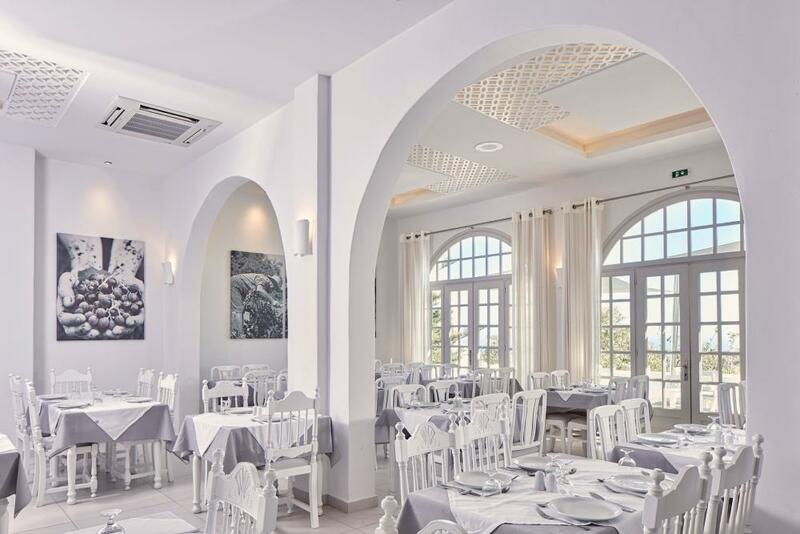 For breakfast or dinner the elegant environment creates a tranquil atmosphere combined with the finest and carefully selected raw materials in a variety of dishes inspired from Santorinian, Greek and International cuisine. Located right next to the pool, serves fresh juices and delicious coffee as well as light snacks and lunch suggestions with a Mediterranean flavour. Sip a midday mojito as you float around the pool or enjoy a fresh, creative cocktail while lounging poolside. Days in Santorini could easily be full but time for some working out will be necessary. The gym has been designed to help you relax and take care of your body. This facility has all the necessary equipment for “summer” exercising. The Lotus Spa, the biggest spa center in Santorini Island is ready to welcome you. Indulge in the hands of the highly skilled personnel and give to your holidays a unique feeling as you are doing yourself a magical gift. Lotus Spa is member of the sister property, El Greco Resort and Spa which is located just a few steps from the center of Fira, the capital of Santorini. Book your treatments via the front desk. Free transfer will be offered to and from the spa center. Hotel is located in Firostefani village just 10 minutes walk from the capital of Santorini, the village of Fira. 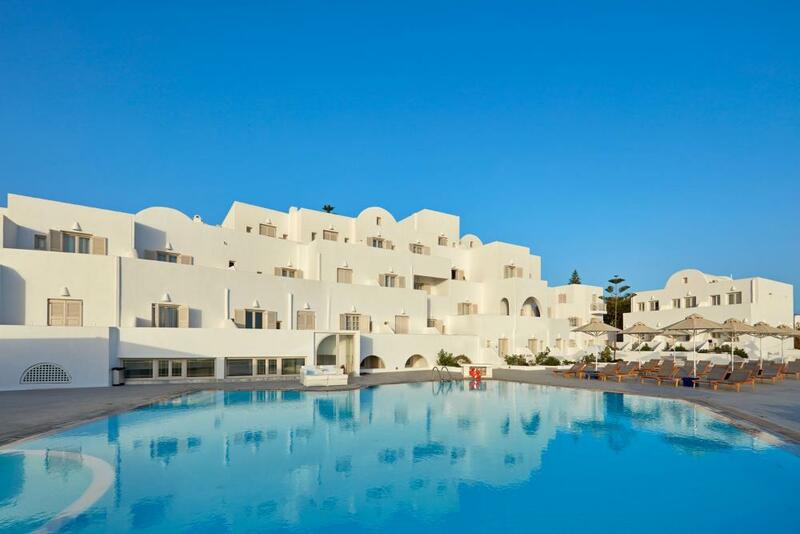 Santorini Palace combines the Cycladic surroundings with the breathtaking views of the east side of the island. Nearby Attractions are The Dominican Convent, The Catholic Cathedral, The Greek Orthodox Cathedral, The cable car and the old port, The Archeological Museum, the Prehistoric Museum, shops, restaurants and nightclubs.